The City Municipality of Bremen is a Hanseatic city in northwestern Germany. A commercial and industrial city with a major port on the river Weser, Bremen is part of the Bremen-Oldenburg metropolitan area (2.4 million people). 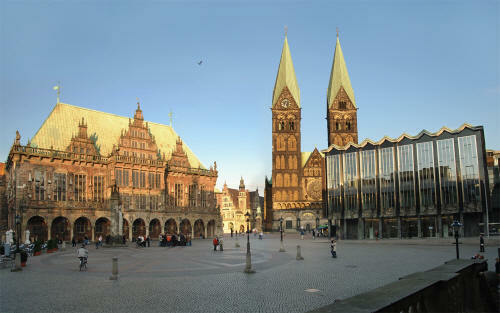 Bremen is the second most populous city in North Germany and tenth in Germany. 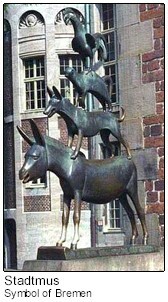 Bremen is some 60 km (37 mi) south from the Weser mouth on the North Sea. With Bremerhaven right on the mouth the two comprise the state of Bremen (official name: Freie Hansestadt Bremen1 - Free Hanseatic City of Bremen). Second most important foreign trade location in the Federal Republic of Germany. It history dates back 1,200 years to the early centre of the Christian missions to North and Northeast Europe, major role among the towns of the mediaeval Hanseatic League, historically evolved as city republic in the tradition of a trading centre on which patricians left their mark. Bremen has an international airport situated in the south of the city. The Bremen site is the second development centre after Hamburg. It forms part of the production network of Airbus Deutschland GmbH and this is where equipping of the wing units for all widebody Airbus aircraft and the manufacture of small sheet metal parts takes place. Structural assembly, including that of metal landing flaps, is another focal point. Within the framework of Airbus A380 production, assembly of the landing flaps (high lift systems) is carried out here. The pre-final assembly of the fuselage section (excluding the cockpit) of the A400M military transport aircraft takes place before delivery on to Spain. More than 3,100 persons are employed at Bremen, the second largest Airbus site in Germany. As part of the Centre of Excellence - Wing/Pylon, Bremen is responsible for the design and manufacture of high-lift systems for the wings of Airbus aircraft. The entire process chain for the high-lift elements is established here, including the project office, technology engineering, flight physics, system engineering, structure development, verification tests, structural assembly, wing equipping and ultimate delivery to the final assembly line. In addition, Bremen manufactures sheet metal parts like clips and thrust crests for all Airbus aircraft as part of the Centre of Excellence - Fuselage and Cabin. In Bremen there is a plant of EADS Astrium and the headquarter of OHB-System, respectively the first and the third space companies of European Union. A large number of food producing or trading companies are located in Bremen with their German or European headquarters: Anheuser-Busch InBev (Beck's Brewery), Kellogg's, Kraft Foods (Kraft, Jacobs Coffee, Milka Chocolate, Milram, Miràcoli), Frosta (frosted food), Nordsee (chain of sea fast food), Melitta Kaffee, Eduscho Kaffee, Azul Kaffee, Vitakraft (pet food for birds), Atlanta AG (Chiquita banana), chocolatier Hachez (fine chocolate and confiserie), feodora chocolatier.